Just a quick update. The NEW "Memory Box" Dies have finally arrived in store. This is just a sampling, we received lots of different ones. 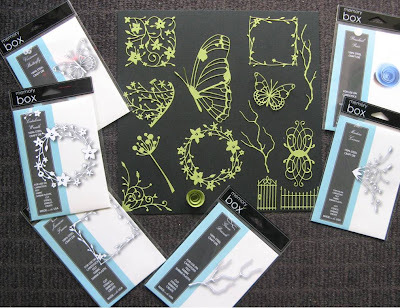 These are soooo gorgeous, so very fine & are compatible with most Die Cut Machines. The best part about these is the prices, I haven't quite finished pricing them all, but so far they are all under $20!!! Great value. Also received lots of top up stock yesterday including Tim Holtz, New paper ranges & the fabulous Martha Stewart Paper Cutters. These just run off the shelves. Definitely the best paper cutter I have used. Well thats all for now, got to run, school holidays are always flat out for us.